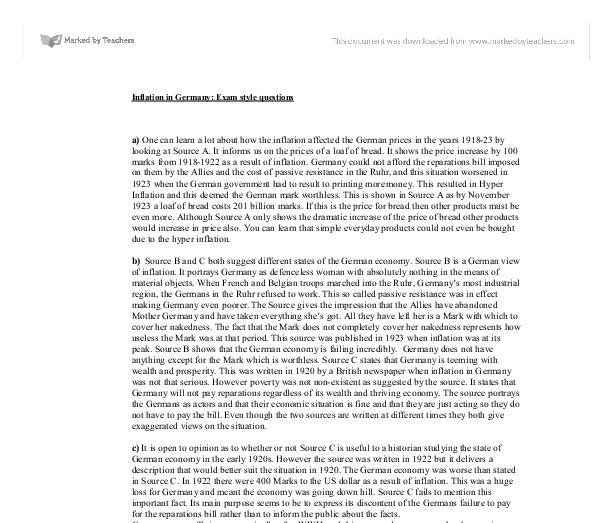 Inflation in Germany: Exam style questions a) One can learn a lot about how the inflation affected the German prices in the years 1918-23 by looking at Source A. It informs us on the prices of a loaf of bread. It shows the price increase by 100 marks from 1918-1922 as a result of inflation. Germany could not afford the reparations bill imposed on them by the Allies and the cost of passive resistance in the Ruhr, and this situation worsened in 1923 when the German government had to result to printing more money. This resulted in Hyper Inflation and this deemed the German mark worthless. This is shown in Source A as by November 1923 a loaf of bread costs 201 billion marks. If this is the price for bread then other products must be even more. Although Source A only shows the dramatic increase of the price of bread other products would increase in price also. You can learn that simple everyday products could not even be bought due to the hyper inflation. ...read more. The German economy was worse than stated in Source C. In 1922 there were 400 Marks to the US dollar as a result of inflation. This was a huge loss for Germany and meant the economy was going down hill. Source C fails to mention this important fact. Its main purpose seems to be to express its discontent of the Germans failure to pay for the reparations bill rather than to inform the public about the facts. Germany was suffering economically after WWII, and this was made even worse by the massive reparations bill imposed on them by the Allies. Source C fails to mention the total, which was about 144,000 million marks. Considering the situation Germany was in at this stage this bill would cripple Germany if paid. The fact was that Germany could not pay. Source C seems to imply that Germany would not pay. This Source seems to be more opinion than fact and is against Germany. This may be because the Source derives from a British newspaper and will therefore consist of a mainly British view. ...read more. However it does not inform us on how dire the situation was in Germany. It does not say Germany could not pay the reparations but it does imply this. Basically this Source provides us with a summary of events and does not really go into that much detail. Source E however does not mention various details as well as suggesting that reparations were justified. 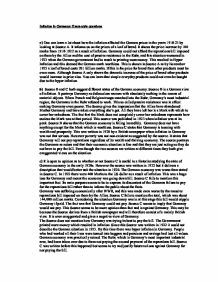 It does not mention the exact amount of the bill nor does it mention that the German currency was useless due to the inflation. Not only did it cost two per cent of Germanys national output per year but the Ruhr was also taken and Germany was economically suffering after the war. They also had to pay this money with their worthless marks. Both sources fail to mention how bad the situation in Germany. They could not pay the bill. People were forced to live on the streets and savings were worthless. By saying the payments were not too harsh the source has automatically taken the allied side. This source suggests that Germany did not want to pay the bill even though they could. However the actual fact of the matter is that they didn't want to pay for the bill and they couldn't. ...read more. After that it follows what the theory would suggest. What was happening at the beginning of 1999 and the information that has been shown in graph 1 and graph 3 definitely suggest that it is not just the MPC that is affecting the inflation levels and helping to have kept the price stability from 1993. Therefore Germany is the main trading partner of most European countries. Its major trading partners include France, the United States, the United Kingdom, Italy and the Netherlands. Germany is also the world's top exporter, ahead of the United States and China. Young reported in 1925 that 25% of the government employees were sacked; all temporary employees were discharged and all above age of 65 retired. Additional 10% of the civil servants were sacked. Railways discharged 120000 employees in 1923 and 60000 more during 1924 and 65000 staff of postal administration were sacked.